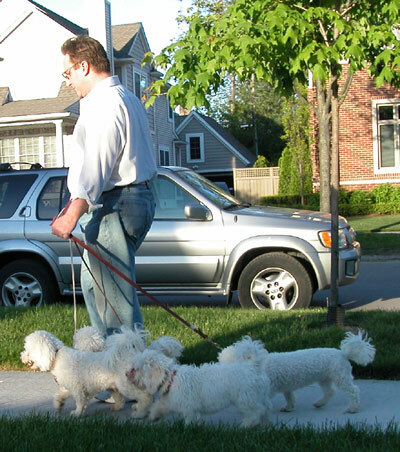 We have several small dogs that used to pull on the leash when we walked them. They would also not reliably follow our commands such as come, sit, stay, etc. We purchased both of your DVDs and employed your techniques and the results were remarkable. The dogs are no longer pulling on the leash and they now consistently obey our commands. They also seem much more relaxed, calm, and content. Your DVDs are amazing. The results were immediate and miraculous. Your techniques are incredible. The dogs actually look forward to the training sessions. We are now able to fully enjoy them as the beloved members of our family that they are. We think that your dog training program is fantastic. Your terrific DVDs are not only tremendously helpful and informative but they are entertaining as well. You are so funny! Your humor makes it a pleasure to watch the DVDs and we look forward to watching them over and over again to review all of the fine points. We understand now that only perfect practice makes perfect! Bonny does an outstanding job on the DVDs as well and the two of you seem to work extremely well together. We are very grateful to both of you for putting together these fine DVDs and appreciate all of the hard work involved in creating these important educational tools. The instructional booklets that accompany your DVDs are also extremely helpful and entertaining as well. You should both be very proud of these outstanding DVDs. We recommend them highly and without reservation to all dog owners, even if their dogs have no particular obedience issues. They will optimize your relationship with your pets and bring you even closer to your pet than before. You will also more fully enjoy your dog when he obeys all of your commands without hesitation. Another important reason to purchase the DVDs is that they may save your dog's life one day. The DVDs teach you how to reliably train your dog to come, stop, and stay consistently despite outdoor distractions. It is important to purchase these extraordinary DVDs for safety reasons alone. Vladae, we have tremendous respect for you and your life's work. Your credentials are truly impressive and inspiring. You should be very proud of the fact that you have saved thousands of dogs that would of otherwise been killed because they were thought to be hopeless cases. You have also helped countless tens of thousands of other dogs and their owners live a more balanced and harmonious life together. As much as we loved our dogs prior to your DVDs, we are even more close to them now that they are trained. Our dogs seem happier too! We thank both you and Bonny for putting together these incredibly helpful and informative DVDs. We look forward to all of your future publications. 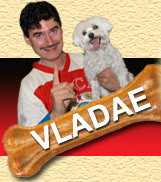 Vladae, we love to watch your segments on the local Fox TV network and we hope that one day soon you will have your very own prime time TV show dedicated to dog training. I know that it would we a tremendous success and very well received. Vladae, we remain your biggest fans and appreciate all that you have done and continue to do to help people enjoy their pets even more than they already do. We wish you the very best in all of your future endeavors. Thank you for dedicating your life to saving and helping these wonderful animals.